Mini (or palm top) projectors may be tiny but they get the job done. 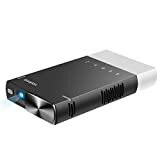 If you are looking for something compact and efficient enough to wow a business presentation or enjoy a movie night with your family wherever you are, then this convenient gadget is what you are looking for. There are tons of options out there and the difference between them could mean the difference between impressing your board of directors or leaving them disappointed. 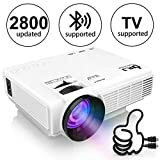 To help you sift through hundreds of options to find the perfect wowing projector for you, we have put together this Mini Projector Shopping Guide. Palm-top Mini Projectors: Offering a lot of power for their size, these portable projectors can produce larger images. 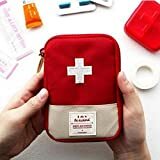 On average they are about 2.5 by 5 inches in size, making them small enough to bring to any presentation but still big enough for movie night at home. Pico Mini Projectors: These lightweight projectors are about the size of a mobile phone and generally can fit into a pocket. 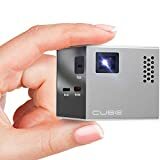 Ultra portable and small enough to go everywhere, they are the ultimate convenience projectors which you can set up any time, any where. Picture Quality: Good quality imaging is rated high by consumers as it gives them clear viewing in any light situation for a multitude of uses. It is suggested that you check if your new prospective projector has the capabilities and functions that will meet your needs, whether it is putting cartoons on for the kids or wowing the conference with your presentation, and you won’t be disappointed. Set-up: Reviewers rate mini projectors much higher if the setup is easy. Easy setup means you will be able to take your projector out the box, plug in your video source and start using it straight away with minimal hassle. Sound: Owners who use their projectors for home viewing consider sound an important feature for their projectors. Therefore, units that have good sound and don’t require added speakers are rated much higher than those that don’t. If sound is important to you, checking the manufacturer details of the product you are interested in will ensure that it meets your needs. Connections: According to commenters, USB and HDMI connections are a must. 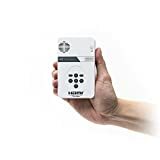 These connections will ensure that your projector works with your modern home entertainment system. Multiple USB and HDMI connections will offer you a lot more options. 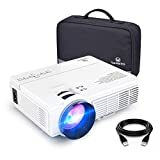 For better picture quality, choose a mini projector with an image projection size of at least 25 - 50 inches for optimal viewing. If you are planning to watch movies with your new mini projector, then the higher the resolution the better. If you are going to use it for great powerpoint presentations, then a lower resolution of about 800 x 600 will be sufficient. The brightness of a mini projector is measured in Lumens and will not only determine the image size possibilities but also what lighting conditions your unit can operate optimally in. Higher end projectors generally offer more brightness which will allow you to use yours in more situations as well as increasing the image size without sacrificing clarity. 300-350 lumens will offer the most functionality for your money. The bigger the surface area you wish to project onto, the bigger the image capabilities your projector needs to have. This is determined by the brightness of your unit, and choosing this is determined by your needs. If you don’t plan on watching images 70 inches or bigger, then you can get away with a lot less brightness. Choosing a projector with internal memory and built-in file decoding is a huge convenience. These features will allow you to copy over your presentation file directly onto the projector ahead of time, allowing you to travel without needing to bring other heavier devices. 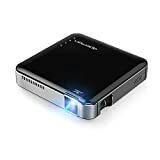 Another way to avoid having to bring your laptop with you, is to choose a mini projector with a USB slot. This is very handy feature that allows you the convenience of one device for the presentation. It also leaves you with carrying space for a small foldable projector screen, just in case you get to the destination and find there are no white walls. Connection ports are important! 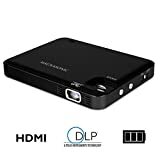 It is helpful to make sure your new mini projector has enough ports for you to connect to various video devices and computers. Considering what you will use your projector for will help determine what battery life you need your new projector to have. For presentations, choose battery life over power. For movie watching, it is better to choose power over battery endurance. Sound quality is an important factor to take into consideration if you plan on watching movies or need sound for your presentation. For that authentic cinema sound consider an added surround sound system to projector setup. Added functions can add pleasure to your projector use. Remotes, for example, are a great accessory for changing settings during presentations if you like to walk around the room. For presentations where you are in arms length of the device, a touch screen display offers easy operation. Projector accessories that allow you to stream movies and TV shows directly through your projector are a great feature for video enthusiasts. 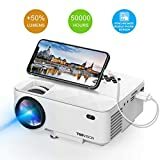 If you only want to project video or images from an iPhone, there are numerous companies that make dedicated iPhone projectors. 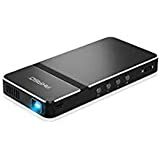 Mini projectors differ widely in size, from ultra portable devices that weigh 0.3 pounds, to small 2 pound units. Consider how much traveling you plan on doing with your projector when choosing the right size for you. If your new projector doesn’t have keystone and zone adjustments that allow you to make display adjustments, then buying a tripod will ensure more versatility and flexibility. Aaxa: Aaxa was founded in 2008 as a manufacturer of micro/mini projectors, and in 2010 launched the world’s first pico projector. They have numerous patents in Liquid Crystal on Silicon and optical designs. Brookstone: Brookstone is a privately owned company headquartered in Merrimack, NH. Their retail stores are unique in that consumers may use and play with any product in the store before buying them. Their mini projector was our number one ranked projector at the time of writing. FAVI: Favi Entertainment designs and markets projectors, mobile accessories, and digital media devices. They have produced over 120 products since they began in 2006 and are a favorite among consumers in the projector market. RioRand: A Canadian company, RioRand specializes in bluetooth accessories and automotive electronics but sells everything from oscilloscopes to LED nail polish dryers. They currently manufacture four different mini projectors.